Andonstar ADSM302 is an Long Object Distance Digital USB Microscope. ADSM302 realized Full HD, high object distance, multifunction, multi-output at the same time. 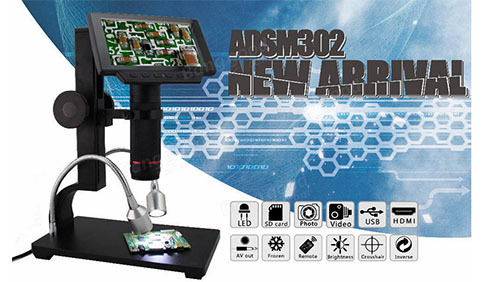 ADSM302 is a multifunctional digital microscope individually designed, developed and manufactured by Nandrepair Technology Co. It realized Full HD, high object distance, multifunction, multi-output at the same time. With help of the Andonstar measuring software, it can easily meet many different requirements in many industries, such as industrial overhaul and teaching demonstration. And it’s appearance design combines more ergonomic consideration, provides users better experience. We sincerely wish this product can release your eyes and improve your work quality. Thanks for your support. This operation manual allows you to work safely with the digital Microscope. Please keep this manual for your information. Liability is void for any damage caused by not follow this manual. Failure to follow the warnings and instructions may cause electric shock, fire and/or serious injury. Not following this note can cause permanent damage to the device. Storage and transport: Improper transport can harm the device; Always transport this device in the provided box in order to prevent damage. Information on disposal: Electronic equipment does not belong to domestic waste, but must be disposed in accordance with the applicable statutory provisions. In order to bring customers a better experience, we may change the product a little bit during perfecting it. The description in this instruction is for reference ONLY. Thanks for understanding. 1.Keep the tool dry, clean, free from oil, water, gas or other materials capable of causing corrosion. 2.This appliance is not intended for use by people with limited physical, sensory or mental capabilities. 3.Keep bystanders, children away while operating the tool. 4.Do not overreach, keep proper footing and balance at all time.